Advantages: Tells the often neglected story of the Luftwaffe's transport units including aircraft and operations; concise and interesting narrative; large, relevant photos; great profiles - terrific inspiration for modellers. 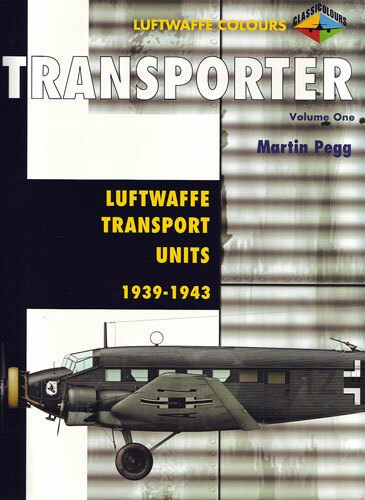 Classic Publications has now released the first in the short "Transporter" series, covering Luftwaffe transport aircraft and operations from the pre-war until 1943. This title is largely the story of the famous "Tante Ju", the Junkers Ju 52, although other aircraft types also receive brief coverage. These include the gigantic Me 323, gliders and their tugs, the huge Bv 222 seaplane, the He 111 "Zwilling", Fw 200 and Junkers Ju 290. The side profile illustrations are very attractive, and cover a wide selection of early to mid-war transport aircarft. My favourite would be the garish red and white Lufthansa Ju 52.